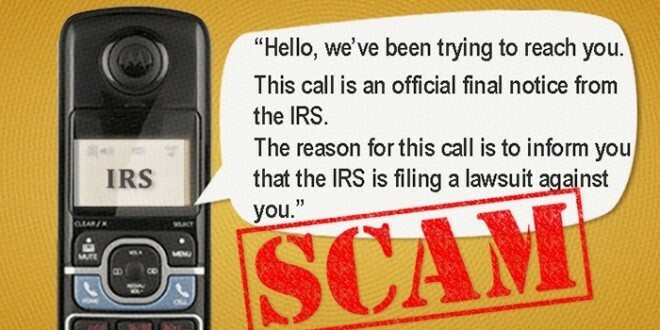 IRS scam calls tax How to easily identify an IRS scammer in USA? Time and again we often hear about the different types of scammers who reside in the www. They interrupt the happiness in our life. And then out of nowhere someone calls you and says that you have done a major fraud in the tax system and the entire Tax and Revenue system is behind you. Imagine this situation. Most probably these scammers are operating from some call centre in India. Scammers have got innovative. Remember the Nigerian Prince who wants to share his 5 million dollars in your name and for that, he needs you to submit some amount to claim those millions. Maybe these scammers got to know that with time even people change. There is a long going IRS scam in the United States and these scammers duped multiple people over million dollars annually. The reason why I am writing this article is because I got a similar scam call yesterday with someone claiming to be police officer Bryan Alexander. I am going to share my experience here and I will post some valid points to easily identify these IRS scammers. The other day I was busy checking some Black Friday deals on my mobile phone when I got a call from 911. I was actually worried about why would someone call me from 911. Then I spoke to the guy who introduced himself as a police officer from Ashville, where I live. He said that an arrest warrant was issued for me for some fraud that I did in the tax filing last year. He claimed that IRS, the internal revenue system, the agency responsible for the collection of taxes and enforcement of tax laws in the USA had filed a complaint on me. This actually freaked me out in the beginning. He then asked me to google for a phone number. And that turned out to be the phone number of the Ashville Police station. The guy gave me his full name and his badge ID like he was a real cop. He wanted me to cooperate with him else he would be sending cops to my house to get me arrested. He didn't let me talk. This guy put me in a conference call with the guy claiming to be the IRS officer from his Washington DC office. The call looked genuine to me at the beginning. So he called me 'Mr. Ste-fun'. This was where I got the first doubt. No American would call me Stefun which ideally is the Indian/Asian pronunciation of my name. I carefully listened to the tale that the guy was cooking. He reiterated the story about my arrest warrant that the other guy from the Ashville line had told. He asked me if I want to hire an attorney or want to settle the matter out of court. He asked questions like Who filed your taxes and all. He didn't let me talk while he was talking. I asked how do I settle the case out of court. He said that I need to go to a nearby shopping mart and ask for a gift card of $1000. It was then I confirmed myself that the guy is a fakester, scamster or whatever you tag them. I could have made fun of them but I didn't want to entertain them any longer. I immediately called 911 and informed about all this. The lady officer on the line confirmed that it was a scam and asked me to ignore them. There are a few points I would like to share from my experience. 10. Watch out for their accent. Their Indian accent eventually shows up after some time. If you are not sure then call the IRS at 1.800.829.1040. The IRS officers can help you with any payment issue or report the incident to the IRS at www.tigta.gov. SO, remember these points and save your hard-earned money.